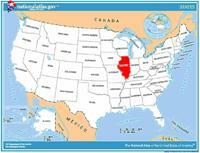 ﻿ Fun Easy English - Travel the United States of America - Illinois. Learn before you travel. This section of Fun Easy English focuses on facts and other cool stuff about your favorite U.S. state. This is great English reading practice. 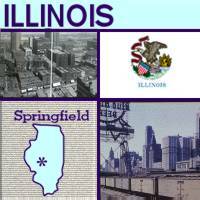 This page focuses on the state of Illinois. The first Illinois state flag was officially adopted in 1915, a result of the efforts of Mrs. Ella Park Lawrence and the Daughters of the American Revolution. Miss Lucy Derwent's design was selected from among 35 entries submitted by chapters of the D.A.R. The Illinois flag features the central image of the state seal on a field of white (the Illinois seal features an eagle holding a banner in its beak with the state motto written on it; “State Sovereignty, National Union”). The current version of the Illinois state seal was authorized in 1867. August 26, 1818, is the date that the first Illinois Constitution was signed. In 1969 the current flag design was approved (the word "ILLINOIS" was added, as well as the sun on Lake Michigan's horizon in the background). Motto State sovereignty, national union. Origin of Name French version of an Algonquin Indian for "warriors"
Travel and tourism site for Illinois - This state travel and territorial tourism site provides ideas for your vacations, meetings, and more. Did you know that before the movie industry moved to Hollywood it had its beginnings in New York City and Chicago, Illinois? If the "windy city" of Chicago seems like an odd place to make movies, (or motion pictures, as they were commonly called), it actually made a lot of sense at the time. The reason the film industry started in these cities is because there were plenty of trained professionals (acrobats, dancers, actors, and stagehands) from vaudeville, the performing arts theater that was popular at the turn of the century. The types of vaudeville acts that worked the best for early films were called "dumb" acts. In this film, a baboon "plays" a violin, a dog jumps rope and a donkey plays at biting and kicking two men. Can you guess why they were called "dumb" acts? Early films were both short and silent, so "dumb" acts were acrobatic or animal acts that were entertaining without any dialogue or sound effects. "Dumb" acts were usually at the beginning or end of a vaudeville show, when people were filing in or out of the theater and noise did not prevent others from enjoying the performance. The film on the previous page as well as the film on this one are typical of the kinds of early films produced in Chicago in the early 1900s. You probably receive many catalogs in the mail selling all types of things. But have you ever seen a catalog that sells houses? Between 1908 and 1940, as many as 100,000 Americans bought their house from a Sears catalog! The houses would be shipped by railroad and would include about 30,000 parts - not counting the nails and screws. All of the major parts were there; the main thing you had to supply was the lot on which to build. The tagline on the Sears catalog was "Sears...the selling of a dream." The great American dream has always been to be able to own a home of your own, and Sears made houses affordable to many people. In 1908, Model Number 107 sold for between $107 and $650, depending on the options chosen. Can you imagine being able to buy a home for only $107? In addition to saving money on materials, it is estimated that building a Sears house took only about 350 hours of carpenter labor, compared with 580 hours for a conventional house. Many of these mail order houses were built in Downers Grove, Illinois. Today, historians of architecture study these homes, many of which have been unaltered since they were first built. Do you think you need to have special musical training to make a record? You don't if you are a member of the Glen Ellyn Children's Chorus. A chorus is a group of singers who perform together. Founded in 1964, the Glen Ellyn Children's Chorus is an internationally known organization that provides any interested child with a fun choral music experience, regardless of musical background. For many of the children, the chorus is an opportunity to learn how to do something well. As one singer said, "Once, when we sang this really great concert, I knew it was the best thing I'd ever done." Here's what some of the other singers have said: "Chorus is the most special thing I do." "Chorus has shown me what it is to be excellent -- to do my best." About 1,300 children in the Chicago area belong to the Glen Ellyn Children's Chorus, which has made several CDs, such as From Bach to Bebop, which features the music of J.S. Bach (1685-1750) and jazz legend Ella Fitzgerald (1917-1996). The Chorus's programs have served as models for similar groups in the United States since 1964. Ever wonder what it was like to go to school in the 1800s? Well, if you want to travel back in time, all you have to do is go about 30 miles west of Chicago to Naper Settlement. There you will find an outdoor historic village that re-creates 19th century life. Take a stroll down the road and you'll see Copenhagen Schoolhouse. Usually built as close to the center of town as possible, schoolhouses often served as the town's social center as well. Farm children from first grade through high school sat at desks in this one-room school and learned their lessons. In addition to all being in one room, all the students shared one teacher. The teachers were expected to teach reading, writing and spelling; then, they could teach a variety of other subjects as they chose, including geography, history, moral values, manners, truth, and love of country. Lessons were taught mostly through memorization drills and spelling bees. Would you like to have been in school during this time period? The following is a description of national forests and monuments in the state of Illinois. There are no national parks in this state. If you plan to visit or live in Illinois for awhile then you should definitely plan to visit some of these fantastic places. 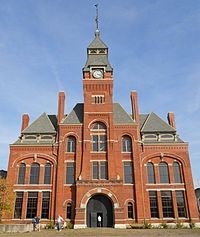 Built for the Pullman Company, it was the first planned industrial community in the United States and the site of the 1894 Pullman Strike.